Clarion, JVC, and Kenwood have introduced new CarPlay systems at CES 2017 this week in Las Vegas, providing iPhone users with additional aftermarket options for adding Apple's in-car software to their dashboards. Clarion's new flagship NX807 unit is a 7-inch HD touchscreen with tilt control. In addition to CarPlay, it is SiriusXM ready and features an HDMI input, dual USB ports, support for Pandora and Bluetooth music streaming and calling, embedded GPS navigation, RCA audio and video inputs, rear-view camera support, and more. For audio aficionados, the NX807 has optical digital output that enables plug-and-play integration with Clarion's Full Digital Sound processor. The unit also supports high-resolution 96kHz/24-bit FLAC audio and has a 15-band graphic equalizer with low-pass and high-pass filters and Dynamic Bass Enhancement. Clarion said the NX807 will be available in early 2017 through retailers such as Amazon, Crutchfield, and Sonic Electronics. Pricing was not disclosed. 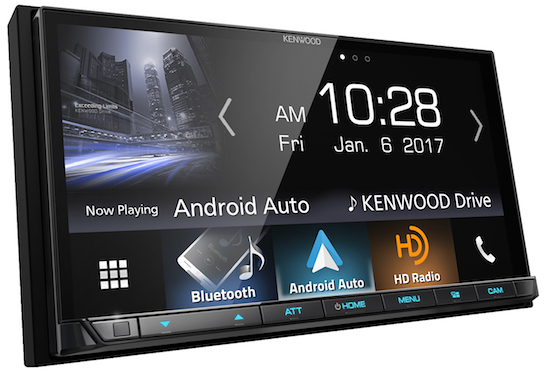 Kenwood's new DMX7704S unit has a new clear resistive display panel with improved touch response and electronic viewing angle adjustment. In addition to CarPlay and Android Auto, it features dual USB ports, HD Radio, SiriusXM access, Pandora and Bluetooth music streaming and calling, rear-view camera support, and more. The DMX7704S supports the High-Resolution Audio format and is able to play media encoded as 192kHz/24-bit WAV (Waveform Audio) or DSD (Direct Stream Digital) files. The receiver is also compatible with FLAC (Free Lossless Audio Codec) and AAC (Advanced Audio Coding) files. It has a built-in 13-band equalizer. Kenwood said the DMX7704S is scheduled to ship in February for a suggested price of $550. Sound of Tri-State appears to be accepting pre-orders now. JVC will be introducing seven new multimedia receivers for 2017, including two with CarPlay and Android Auto support. A new KW-M730BT model, for example, will feature a 6.8-inch screen with a USB port and support for 192kHz/24-bit FLAC-encoded media. Pricing will start at $280, with first quarter availability. None of the Clarion, JVC, or Kenwood models appear to support wireless CarPlay. iPhones must be connected to the systems with a Lightning to USB cable. 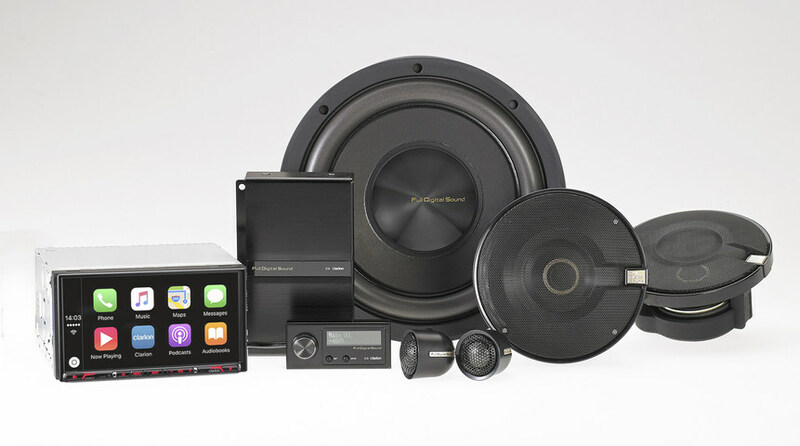 I applaud car audio manufacturers for making aftermarket CP/AA units available. I just wish car manufacturers weren't doing everything in their power to make aftermarket units so difficult or impossible to install/integrate. I remember the good old days when a car either had DIN or Double-DIN space and few required breakout boxes for door chimes, etc. Now there's so much integration of the car's onboard computer systems, climate controls, and other bells & whistles it takes custom dash and brace kits, multiple breakout boxes, and a virgin sacrifice to the car audio gods to get an aftermarket unit into a new vehicle. Which is a shame, because in my experience, the baked in "infotainment" software in most new vehicles is abhorrent. Why are there no single-din carplay units? Is there something in the specification preventing these from being made? Currently wireless CarPlay uses wifi, so I'm guessing these aftermarket companies have not yet figured out a way to jam all the gear including wifi into these double DIN chassis. Probably because that would require too much investment on the manufacturer, for a category they aren't actually doing much R&D for. Don't let these annual "upgrades" fool you- They have done very little over time other than repackaging the previous year's HU with slight UI changes that could have been done via a software update. Cant do that though because how else will they get their 17 customers (I happen to be one) to buy something new. Why are we not seeing any wireless CarPlay units? Well get it next year.